With many school districts "going Google," some educators are finding that they might have multiple Google accounts. 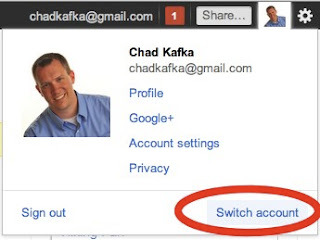 Switching between these can be frustrating in your browser, but fortunately, Google has a built-in feature that users can turn on called Multiple Sign-In. Google's directions for turning this on are here. Go to the Multiple Sessions Sign-In Page and log in with one of your Google accounts. If you logged in to a PERSONAL account, you might be at the Account Overview page (shown below). Look for MULTIPLE SIGN-IN and click EDIT. Click ON for Multiple Sign-In and then click SAVE. 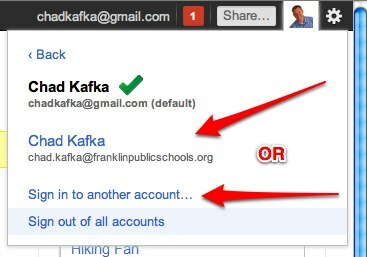 After saving your choice, click on your Google account name on the top right and choose SIGN OUT. 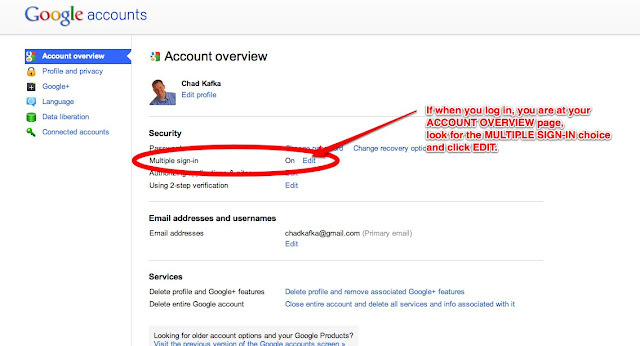 Go BACK to the Multiple Sessions Sign-In Page and log in to ANOTHER Google account. Repeat the same process as above and turn on "Multiple Sign-In" for this account and then sign-out when finished. What will happen now going forward is that when signed in to one of your accounts, you can go up and click on your Google account name in the top right of the browser and choose SWITCH ACCOUNT (shown below) to easily switch to another account. After choosing SWITCH ACCOUNT, you will see your other accounts listed that have Multiple Sign-In enabled (shown below). If for some reason you don't see your account, you can click the choice that says "Sign in to another account" and after entering the credentials for that other account, it should show there in the future. Once that is all set up it's very easy to SWITCH accounts in your browser! As a tip, always pay attention to which account is showing on the top right of the browser in the black bar to know which account you're in. And if you switch accounts on that tab, it sometimes might not switch accounts on the other tabs you have open so make sure to close all other tabs as to not confuse the browser. In Chrome, you can open a separate window that is totally independent of the account you're currently logged into. This is called the INCOGNITO window. Go to FILE > NEW INCOGNITO WINDOW (or CMD+SHIFT+N as a shortcut) and a separate window with a "blue" border will open. The little icon of the spy in the corner tells you that this is the "incognito" window. :) This is great for doing demos or showing students how to log into an account without having to log out of an account that you currently have open. Screenshot below. Here is another cool trick - once you have multiple sign in enabled you can have both accounts open in separate tabs in the same browsers. Just bookmark https://mail.google.com/mail/u/0/#inbox for your first account (I usually use this for my school account) create another bookmark for https://mail.google.com/mail/u/1/?shva=1#inbox to open your other account in a new tab. YOu can keep increasing accounts by changing the number after "mail/u/" in the url. You can also control click to pin the tab so the next time you open Chrome (on any computer) those accounts open in the browser in separate tabs.